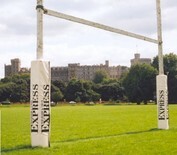 Rugby Goal Post Protectors & Pads for Sale UK | PREDATOR! A range of Predator! Rugby Goal Post Protectors of various sizes.